Circa-1922 Spanish Revival in Evergreen. George Mahan and James Broadwell were the architects of this elegantly massed house on the southeast corner of McLean and Autumn. This was, in fact, Broadwell's family home. Mahan built for himself a similarly striking house on the northeast corner, but it was lost in the preemptive demolition for the never-built Midtown section of I-40. This surviving sibling is certainly one of the most romantic houses in Memphis. The Spanish Revival style swept the country in the 1920s after the Panama-California Exposition in 1915 in Balboa Park in San Diego. 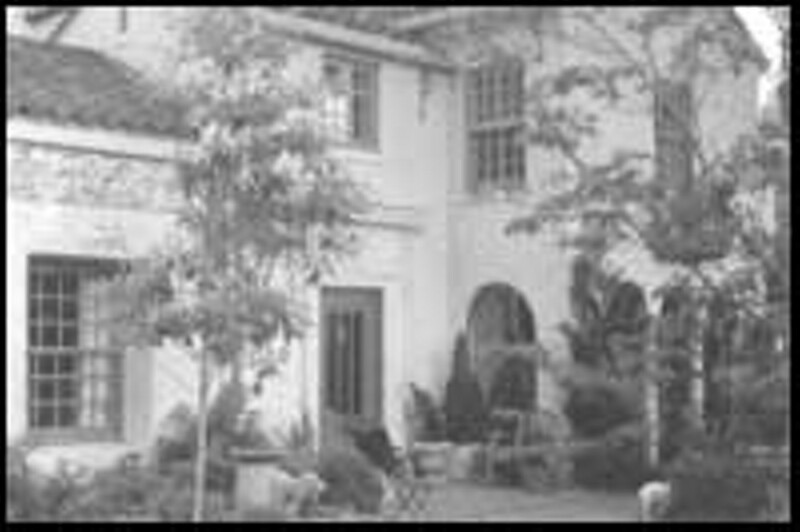 Mahan and Broadwell were masters of the Mediterranean styles, building Italian and Spanish fantasies for clients in Evergreen, Morningside, and Central Gardens. The current owner purchased this property in disheveled condition seven years ago and has been relentless in the restoration of the house and the development of the grounds. The circular drive off busy McLean was eliminated and the entry reoriented to the quiet block of Autumn, where a new two-car garage with carriage doors was built. It gives the house a much-needed air of calm. The entry begins with an iron-grilled view through the wooden gate at the street that culminates in a tiered fountain on an axis with the front door. Formal lawn is surrounded by densely planted beds of shrubs and trees. Sweetbay magnolias hold pride of place at major points. The house telescopes from the corner of Autumn and thus increases in scale as you approach the front door. The asymmetrical massing allows for a great variety of room heights and window placements. The tiled entry opens to a multi-level staircase with delicate iron railing that overlooks the double- height living room. Original Bruce hardwood parquet floors gleam. An overscale, ornately carved stone mantel surrounds the wood-burning fireplace. A gently arched, planked-and-beamed ceiling is highlighted by the original flared-plaster light cove, which still works. A sunroom lies beyond. Both the living and the dining area overlook a rear fountain that cascades down to the patio. The breakfast room retains two original pantry cabinets both with arts-and-crafts hardware and one with a back-lighted garden-trellis pattern of stained glass. A new kitchen was carved out of three small rooms and looks into a mini-greenhouse where bougainvillea blooms. The opposite end of the ground floor contains a guest suite with sitting room, eat-in kitchen, bedroom, and bath. Upstairs are an additional three bedrooms and three baths. Two bedrooms share a dressing/play room and adjoining bath. The master suite is entered through a library that adds privacy to the sleeping and bathing chambers. A window seat in the master bedroom looks discreetly over the rear patio and gardens like a private balcony onto a public square. This house is rich in original details which have only been enhanced by a meticulous renovation. It's hard to believe this quality of work can still be achieved. The surrounding walls add mystery from the street. Inside the walls, plantings, paved areas, and fountains harmoniously integrate the house with its setting. This Spanish Revival residence is simply a romantic oasis. Circa 1860 Greek Revival cottage in Greenlaw.